Last night I found this sketch that I'd doodled a while ago and decided to put it up. 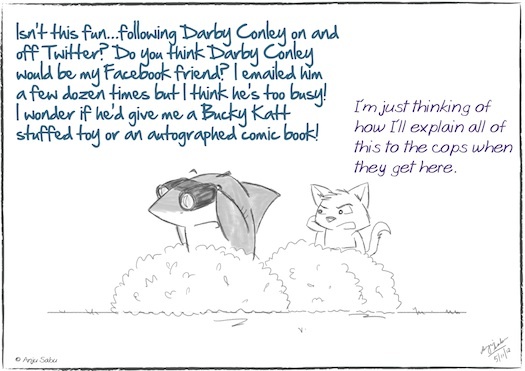 I wondered if I ought to change the celebrity's name (since I stalk several of them) but figured that since the shark has several traits which are similar to Bucky's, he'd be the right stalkee. And maybe Darby Conley will notice this and send me an autographed Bucky Katt doll. ps - Don't forget to comment on the link on my Facebook page and stand to win sharky gifts :) Contest ends on Sunday (11/11/12).